A number of years ago I identified the ‘Zone of Uncertainty’ between the strategic objectives of an organisation, as defined by its Directors and senior executives and the operational levels occupied by projects and programs. The ‘Zone’ can be metaphorically described as a highly complex and dynamic organism requiring agility and understanding to cope with the demands of its chaotic nature (for more on ‘The Zone’ see: The Paradox of Project Control in a Matrix Organisation). More recently we have been focusing on two quite different aspects of project management, one has been looking at the business process architecture that supports an organisations ability to manage its projects and programs, the other is series of high profile project failures that can largely be attributed to failures in the organisation’s ability to initiate and effectively manage its projects and programs. Mosaic’s White Paper, PPP Taxonomy describes the architecture and has links to more detailed White Papers focused on the key components. At the executive level, the processes to frame an effective culture and oversight the capabilities needed to efficiently manage projects and programs. The organisational capability to identify, qualify, quantify and propose future projects and programs that combines innovation with strategic objectives and a rigorous assessment process focused on feasibility, viability and value creation. 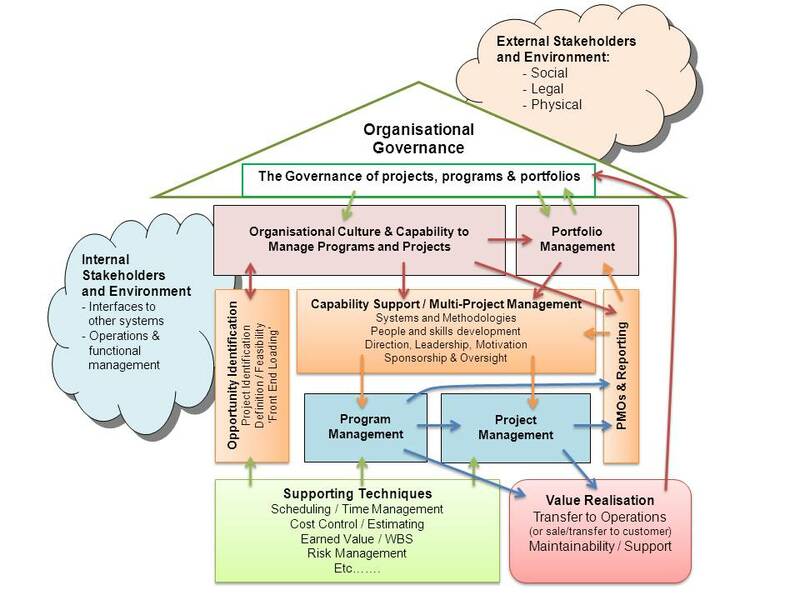 The organisations capability to effectively support and manage all of the projects and programs in its current portfolio of work, including skills development, sponsorship, making effective use of information generated by EPM (Enterprise Project Management) systems, motivation and discipline. If the project is selected for the wrong reason, no amount of skill in the delivery processes controlled by project/program managers will fix the problem. If the organisations systems don’t develop the right people, with the right skills, supported by the optimum processes; the challenge faced by project/program managers is far greater then if they are working in a supportive environment. Really skilled people may succeed in bringing in their project, many will fail. If the organisation cannot understand and deal with the uncertainty associated with projects and programs and seeks to avoid all risks and uncertainties the probability of failure is magnified because the opportunity to properly resolve the uncertainties is removed. If the organisation’s management continually changes the scope and objectives of the project because it lacks discipline or simply did not take the time to understand it requirements the project will fail. It is impossible to fulfil requirements if the stakeholder’s don’t know what they require! The language of ‘failure’ talks about project and program failures, but if the hypothesis suggested in this post holds true, many projects overrunning cost or time, or failing to deliver requirements are a symptom of other more fundamental ‘failures’ in ‘The Zone’. If this is true, the question is how can an organisation develop a mature and effective management structure to increase the success rate of its projects and programs from our current starting point? We don’t even have a generally agreed name for the project/program support capabilities that are failing…. Any comments or thoughts will be appreciated. Why do we waste so much time in marginally productive meetings? Part of the answer has to be the way many meetings are managed (or not managed if they are just allowed to happen). Certainly some meetings are essential and some are even useful but only if they are managed effectively. For the rest, don’t call the meeting if you have control and either don’t attend or delegate attendance to someone else if the meeting is called by someone else. Anyone planning a trip to Paris needs to be ultra careful of pick pockets – the crime is rampant and does not seem to be policed apart from a few notices suggesting you take care! For the first time in more than 10 years I had my pockets ‘lightened’ on our last day before returning to Australia. We knew a scam was on when in the space of 15 minutes 3 different people magically found a large gold ring on the footpath in front of us. The sleight of hand allowed the first person to get close and ask if the ring was mine. Exit one phone… We knew there was a scam involved (but had not missed the phone at this time) but could not work out what the ‘game was’. The second and third times the ring was discovered showed us how the initial part of the trick was performed; the objective only became apparent when I started to peel off layers of clothing in the relative warmth of the Eurostar facilities. A check in London by ringing the phone and voilà the purpose became obvious. Lesson #1 I’m obviously starting to get old and slow down – no one would have got away with that in my youth working around the rougher parts of London… But I have to admire the way the scam works, Fagan* eat your heart out. Question #1 – 3 people in 15 minutes, same scam, same ring, same MO suggests organisation. If we can pick the obvious what are the Paris police doing? Sure the air temperature was well below Zero but the criminals were out and about. If we can sort out the scam at the expense of an $80 phone, what are the professional law enforcers doing?????? Don’t let this put you off going to Paris, it is a marvellous city and far less dangerous then many in the USA – I’d prefer to run into a clever pick pocket any day compared to a mugger or carjacker – but do be careful and keep all of your valuables in inside pockets, preferably buttoned. Any French colleagues reading this – stir up your gendarmerie – the crime is non-violent but still very annoying and the degree of organisation suggests the criminals are well ahead of the police. Despite the cold, the committee stages of ISO-21500 Guide to Project Management concluded successfully in Paris this week. As with any international committee process the final outcome is a melding of different concepts and perspectives and the journey was as important as this initial destination. The final draft standard will be complied in the next couple of weeks following definition, language and translatability checks by the team I’m part of and then a grooming edit to make sure the document flows smoothly by the ‘Editing Committee’ – importantly, theses checks will not change any aspect of the technical content merely start the pre-publication processes. Once the drafting is 100% complete, the document is handed on to the ISO Secretariat to prepare for a vote of all international standards organisations world- wide and assuming a successful ballot, the new ISO 21500 will be published late 2012. The end of a 5 year journey! Publishing ISO 21500 is only start of a process to develop a family of portfolio, program and project management standards. A new ISO technical committee TC258 has been established with a mission/vision to create a useful and functional set of integrated standards to help improve project management world-wide. This development will take a significant amount of time and will seek to meet the needs of all sizes of organisation from small business through to major corporations and governments. To start moving forward on the right track, work has started within TC258 to develop consensus on the overall framework that defines project, program and portfolio management. Because of the wide diversity of approaches, consensus is needed at both the conceptual level – what the ideas actually are; then at the semantic level – what do the words describing the ideas precisely mean. This work will define one dimension of the framework the standards will be developed within. Another key boundary is the interaction between PPP processes and the organisation they serve, including the governance dimension and the links to ongoing operations. Another dimension is the different stakeholder communities the standards are being developed for and by – Directors, senior executives, managers, practitioners and/or a wider public. 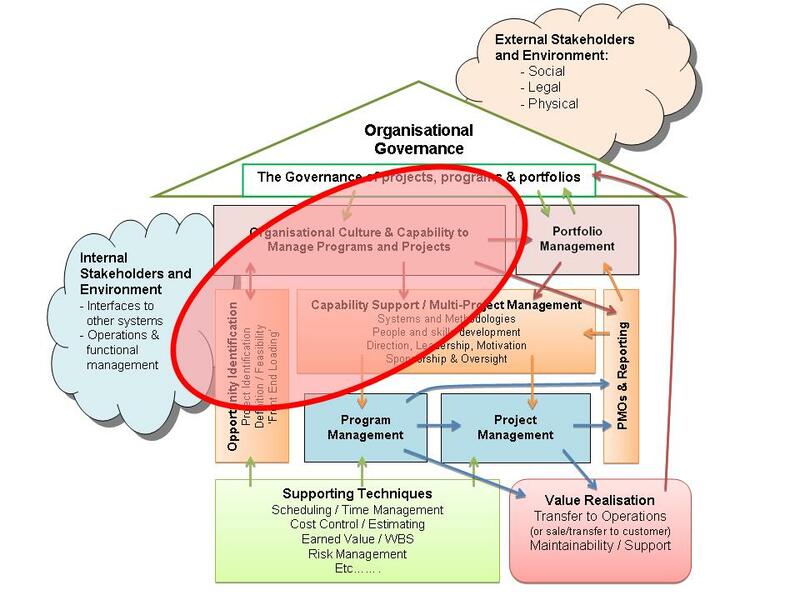 Within the boundaries created by this emerging framework, the architecture defining the components that make up the overall discipline of portfolio, program and project management will need to be developed and agreed, including understanding how the different components interact and support each other. To understand the complexities involved in this work, our updated White Paper A PPP Taxonomy outlines my view of overall architecture. However, we still have a long way to go to reach a genuine consensus world-wide!! !